If you’ve been on the blog or watched my videos in the past couple of months, you may have noticed my steamy love affair with aloe vera gel. It works awesome for me as a gel combined with whatever leave-in conditioner or moisturizer I am using, and I don’t even need to combine it with another gel or styler. Also, it dries very soft in my hair and does not leave me with a product build-up feeling, while giving a bit of hold and clumping my curls. Verdict? I LOOOOVE IT! But just why is it so great? – Try to get the purest form of AV gel you can find; I usually get 99% or 100%. Some formulas have alcohol, silicones or petroleums in them – those aren’t the ones you want. 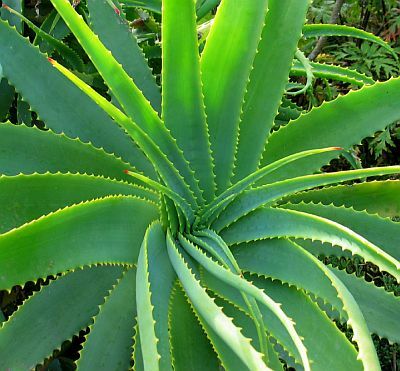 All of them have preservatives though, so don’t be put off if you see another ingredient in addition to aloe vera. The current bottle I have from Trader Joe’s contains parabens, which made me hesitant at first, but honestly, it works so well I got over it. UPDATE 2/19/15: Fruit of the Earth is now my favorite aloe vera gel (on my HG list). It’s pretty much the only one I buy at this point. – If you can, get an unscented bottle. I had a bottle that was scented, and I walked around all day smelling like the pool. I wasn’t very excited about it. – If your aloe vera gel isn’t clear, it most likely has additives that you may not want (please don’t get a bottle of green gel). Also, it may not dry clear in your hair. One of the bottles I had was Lily of the Desert Gelly, and it was sort of milky in color – definitely looked “milky” in my hair until it dried! – Aloe vera gel is available in many places, including your local drugstore (Walgreens, Rite Aid, CVS) and health food stores (Trader Joe’s, Whole Foods, Erewhon). It should also be at places like GNC or Vitamin Shoppe. Yea, I said it. You have no excuse for not getting any! – Aloe vera gel is totally inexpensive – I got a 20oz bottle of Fruit of the Earth AV gel for like, $5. My Trader Joe’s AV gel is $2.99 for 12 oz. Meanwhile, the stinky one I had was about $7 for 16oz…but it was still less than $10. Once again, no excuses! Well, there you have it. I’m not sure if it’s going to continue to be as moisturizing when it’s cold outside, but right now, it’s my go to gel. yes. i just started using it and am loving the results. i much prefer it straight from the plant though. mixed with shea and some leave in… makes the most beautiful, fluffy and moisturized twist out! The aloe vera in my conditioner works great, plus this pomade my girlfriend told me to get is amazing. My hair still hasn’t dried out from this morning. Yes, but the pomade seals in the aloe vera conditioner, correct?